Dams had to have an economic purpose or they wouldn’t have been built. Dams across the Fox were, and are, expensive to build and maintain. Over the past 150 years most have washed out during major floods and rebuilt, some multiple times! 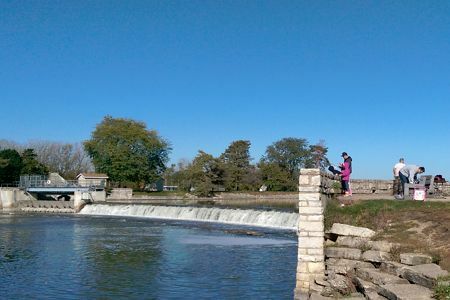 The dam in McHenry was built (and rebuilt) to expand the depth and size of the Fox Chain of Lakes for recreation and to create more valuable shoreline real estate. 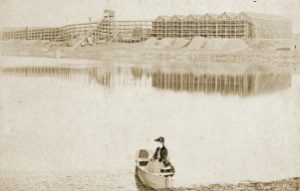 The Algonquin dam was built to increase the depth of the river so boats on the river north of Algonquin could get onto the Chain through the locks at McHenry dam. 1890 photo of Esch Brothers & Rabe’s ice houses in Oswego. The remaining dams along the Fox were built to provide mechanical power, mostly for milling grain into flour and sawing trees into lumber. The pools behind the dams also provided a source of ice during the winter. The ice behind the dams was cut and stored in large ice sheds for summertime use…much like as in Disney’s movie Frozen (but without the reindeer). One important use of Fox River ice was to keep milk cold for shipment from the Fox Valley’s many dairy farms to feed the rapidly growing City of Chicago. While the Fox River dams were being built in the 1800’s many important inventions developed the use of steam and electricity, which could do the same work as power from dams without having to be close to a river. Yankee ingenuity and a few genius inventors would ultimately make the Fox’s dams economically obsolete as a source of mechanical power. At the same time in the late 1800’s many of the technologies developed for electricity and steam power were also being used for refrigeration. Refrigeration (and water pollution) ended the Fox’s dams’ use as a source of ice around 1900. While some dams along the Fox have been used to generate electricity, only the Dayton Dam near Ottawa serves that purpose today. To generate electrical power competitively today using dams (“hydro-power”) requires tall dams fed by very large rivers. This is because electricity can be generated much more inexpensively and in much larger quantities by fossil fuel and nuclear power plants. Today, because of the high cost of the machinery and maintenance of hydropower equipment, solar and wind power are in almost all cases the economic choice for renewable electric power. It seems safe to say the Dayton Dam’s powerhouse stands more today as a museum of the past industrial age than an important example of future electric power. 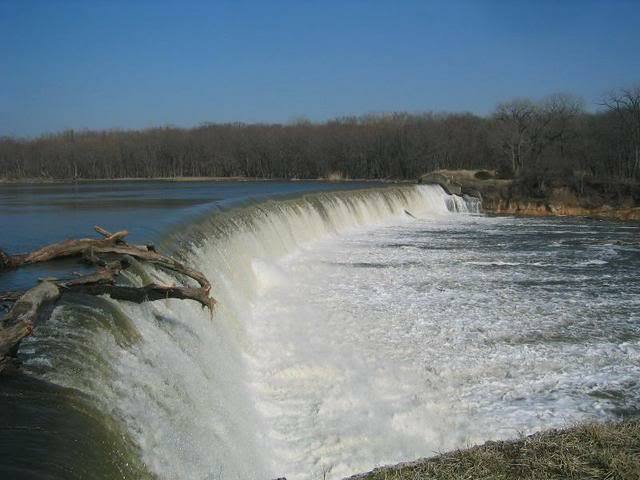 Do you have questions about the dams along the Fox and its tributaries? Let us know and we at Friends of the Fox together with our many partners will use our best efforts to find the answers.